It's finally over. After a very long and arduous time devoted on this wall, finally. This is another one of the parody works I grew to love create. For this latest piece, I decided to go on working on Da Vinci's classic, the Last Supper, and place anime characters into it instead. Indeed, this has to be my most technically challenging wall yet. 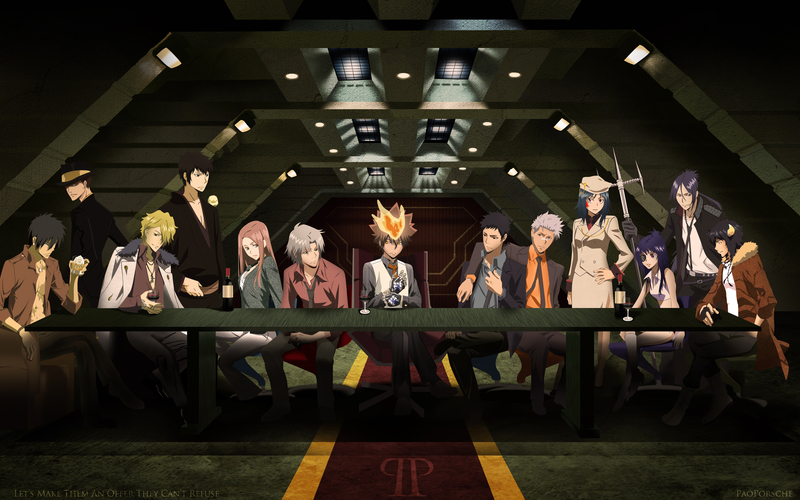 The concept is this: In the future arc of KHR, after the young Vongola Decimo defeated Millefiore Famiglia and returning to his normal time, the future Tsuna now meets with the rest of the family to discuss their next course of action and to layout their terms as they reestablish their claim as the most powerful mafia family in the world. Hence the title, inspired by Vito Corleone of the Godfather. I've placed the process pics to better discuss the details of the walling. It's almost purely driven by Nysha's concept of Vector Mask Painting. I started doing the background (taken from a shot of a promotional picture of Battlestar Galactica), something I rarely focus on from my previous walls, vectored them and added a concrete texture. Next stop was the characters. I used my old technique on modifications and collages of different images to create the most suitable pose. All the images of the characters were either taken from scans of the original artists or from the cards and other paraphernalia of KHR. I had to blend the shadows and lighting to the best of my skills to make the entire wall taken at one time. Well, I'm kinda tired from running around two hospitals and operating on my charity cases. But, walling is a great distraction for me and it I hope to continue some more. Check out the process pics. I need to start reviewing for the in-service exam, so I might postpone some of the projects which I've already made some concepts too. Walls for Fairy Tail, To-Love-Ru, and One Piece. In the mean time, enjoy this wall. BTW, Thanks Brosteb, for all the comments you've made on the wall as well as tipping me about going sepia. Hope THAT version I made suits you. And also, I had the beer I owe you, but since you're not around, I drank it. Thanks for sharing the scan I love your art work! **WHUT!? I thought we're doing this as a collab! ** Oh well since you finished it, I'll comment here. Firstly I would like to commend on your parodies. It's in a way very creative to think of such ideas. There isn't a waller out there who has made as much parody walls out there as you - quantitatively speaking. While I adore the parodies, I feel like there is something off about the wallpaper. The BG looks too realistic compared to the characters even though it is vectored. I think it's because of the textures. You might want to tone down a bit of textures in there. As for the character lighting. It looks like it can be improved further well, because they - all characters- are very bright on the upper half while dark on the lower half. It's like their brightness is too uniform and in that type of room. I think darkening some shades on the characters especially those on the sides would give it depth. Also the parts below the table looks unfinished., no matter how hard I try to argue with myself that it _is_ finished. It's like they lost detail --> I actually noticed this when my friend pointed this one out to me saying "Bakit ganoon, parang nde tapos?". I must admit the Pokemon wall of yours did have a nice lighting - if that lighting would be in here I think it would be perfect! But anyway, I'm glad to see you back. Hope to see more parodies from you. Keep it up! artist should look at and see the hard work you put forward to really make this wallpaper happen. In terms of the wall itself, I do feel like the characters could all use some more detailing. is fantastic and they all look very harmonious together. Awesome job altogether, it's nice to see a big piece like this finally finished. This wall is sublime! On a sidenote, It made me want to watch Battlestar Galactica! Uhhh you are awsome! nice job! you really love to do this kind of work! :bow: you have my gratitud by creating this piece. Im very suprise by this! awsome. That's not original Decimo am i right? Its Giotto! you change his hair colour that genius! like how you did this piece especially using a classic painting "The Last Supper" nicely done, keep up the good work! I've been watching this anime lately and this is the best wallpaper I've seen thus far. Well done. This is defiantly worth downloading and applauding!